What is a Native Species and what is an Invasive Species? “Native species” means, with respect to a particular ecosystem, a species that, other than as a result of an introduction, historically occurred or currently occurs in that ecosystem. “Invasive species” means an alien species whose introduction does or is likely to cause economic or environmental harm or harm to human health. What are some of the common invasive species found on Connecticut's Coast? 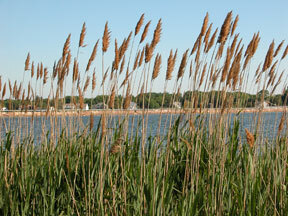 The two species in Connecticut subject to the most extensive control efforts are Common Reed (Phragmites australis) and Purple loosestrife (Lythrum salicaria). Common Reed is a clonal grass found throughout the United States, and is very common on the east coast in brackish and freshwater tidal and non-tidal marshes. Common reed has been a component of wetlands for 100’s of years, but approximately 150 years ago, populations expanded forming large stands and crowding out other vegetation. Through genetic testing, scientists have recently determined that there is native Phragmites australis and a non-native strain that was probably brought from EurAsia in ships’ ballast waters. This non-native strain looks so similar to the native plant that its arrival went unnoticed, and in numerous wetlands, it became the dominant plant. 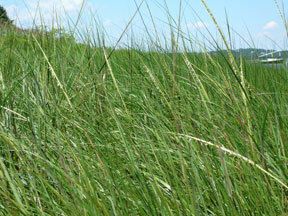 The native Phragmites australis is shorter in height than the non-native strain, and does not form dense monospecific stands. Over time, tidal flow in many coastal wetlands was reduced due to culvert size, filling in of mosquito ditches, and dredging and filling activities. The reduction of salinity levels in these coastal wetlands allowed the invasive Common Reed to rapidly expand, forming large monocultures. The CT Department of Environmental Protection Office of Long Island Sound Programs has worked extensively on tidal wetland restoration projects. By restoring tidal flow to coastal marshes, removing fill, and cutting and herbiciding the Common Reed, native vegetation has the opportunity to become re-established. Of note, scientists, working on the lower Connecticut River in 2006, found populations of the native Phragmites australis (confirmed through genetic testing) growing intermingled with other native vegetation. 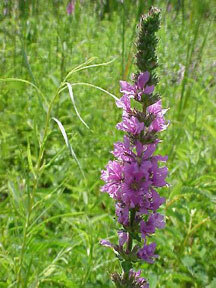 Lythrum salicaria (Purple loosestrife). Photo from the National Park Service. Purple loosestrife is a Eurasian native introduced into the United States in the early 1800’s through both ships’ ballast and as a garden plant. This perennial with bright, purple flowers is found in freshwater wetlands throughout much of the U.S. With a high tolerance for a wide range of environmental conditions, it can quickly spread and overtake native wetland vegetation forming dense, monospecific stands. Small stands of loosestrife may be pulled by hand (preferably before seed set), but all root and stem pieces need to be removed as they can resprout. For larger infestations, chemical and biological control may be used. However, herbicides will kill other plants and state permits may be required if the plants are in standing water. Three insect predators (two beetle species and one weevil) have been released in several Connecticut wetlands in an attempt to control loosestrife populations using biological control methods. For more information on purple loosestrife, how to report loosestrife sightings, and how to be a volunteer beetle farmer, please see the following website: http://www.hort.uconn.edu/IPM/ipmbio.htm. Rugosa rose (Rosa rugosa): Beachgoers will recognize this shrub that is often found growing on dunes and sand flats near the shore. This rose has shiny, dark leaves with large flowers ranging in color from white to dark pink. The fruits are large rose hips sometimes used in jellies and teas. 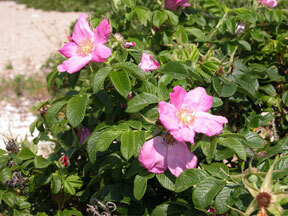 Rugosa rose can form dense thickets and does provide sand stabilization. With its thorny branches, it can also be used to direct pedestrians at dune crossings. However, it does displace native vegetation. This species is listed as potentially invasive in Connecticut and considered noxious in other states. Northern Europe and the Baltic also list it as an invasive alien due to its negative impact on native flora, and it is suggested that it not be planted within at least 50 km of the coast in the associated countries. What are some of the common ANIMAL invasive species found on Connecticut's coast? Asian stalked tunicate (Styela clava) – A tunicate is also called a sea squirt. These marine animals attach to piers, docks, boat hulls, and seaweeds. The Asian stalked tunicate is brown or yellow reaching about 15 cm in length. They are native to Japan and were found in Long Island Sound in 1982, most likely introduced by ballast water. They compete for the same habitat as the blue mussel. Asian shore crab (Hemigrapsus sanguineus) – This small (7–8 cm) crab is a native to Japan and was probably introduced by ballast water. First seen in New Jersey in 1988, this species rapidly spread along the mid-Atlantic and southern New England coasts. It lives in the rocky intertidal and subtidal zone, and is a prolific breeder – with a breeding season twice that of native crabs. This crab is an omnivore with a broad diet including young shellfish and crabs, larval and juvenile fish, algae and salt marsh grass. Scientists are researching this crab and the impacts of its invasion on other species. Spartina alterniflora (smooth cordgrass) is a native plant along the eastern and Gulf coasts where it is an important component of the salt and brackish tidal marshes. This species was introduced on the west coast both by accident and on purpose. In the 1970’s smooth cordgrass was introduced into the San Francisco Bay as part of a project to help stabilize the shoreline. Since its introduction, smooth cordgrass has invaded tidal flats where it replaces native vegetation, causing loss of habitat for salmon and oysters and poses threats to navigation. In addition, in San Francisco Bay, smooth cordgrass has hybridized with the California cordgrass (Spartina foliosa), a native species. The hybrid grows faster than either parent threatening both native plant and animal species. Extensive control efforts involving thousands of acres are currently underway. Phragmites australishas been used for centuries to make thatch roofs. These beautiful roofs are made from bundles of dried stems and attached directly to the rafters. Thatch roofs are at least one foot thick, are great insulators and can last for 70 years with little maintenance. While much more common in Europe, one will occasionally see a thatched roof on a home or barn in New England. For invasive plant species in Connecticut, the Connecticut Invasive Plant Working Group provides detailed information on invasive plant species, fact sheets and numerous websites and publications: http://www.hort.uconn.edu/CIPWG. For invasive species in Long Island Sound check the CT Sea Grant Invasive species page: http://www.seagrant.uconn.edu/LISinvasives.htm. For a national listing of aquatic plants and animals check the Sea Grant National Aquatic Nuisance species Clearinghouse: http://www.aquaticinvaders.org/nan_links.cfm.